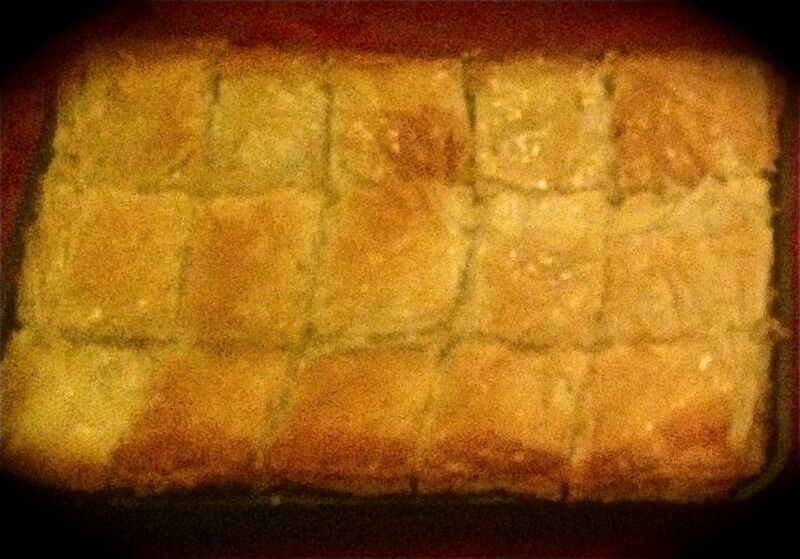 Posted on March 26, 2014 Posted in Greece, Pies, Traditional	. So I have touch on America with a traditional Pumpkin Pie and Italy with Cannoli’s now we are going to Greece for a custard pie. Wait until you try this recipe out and its not even that naughty (ignoring the syrup of course). Grease a 20cm x 30cm ovenproof dish and pre-heat the oven to 180c. Place milk in a saucepan and heat until boiling. Once boiled reduce the heat to low. Pour in the semolina and whish until smooth. Whish in another bowl the egg and sugar until smooth. Whish I cup of the semolina into the egg mix to loosen it up. Now add the egg mix to the semolina on the stove and cook stirring for 5 mins or until the mix thickens. Remove from the heat and stir in the rind and vanilla. Place a filo sheet in the dish and brush with the butter (or spray with oil spray). 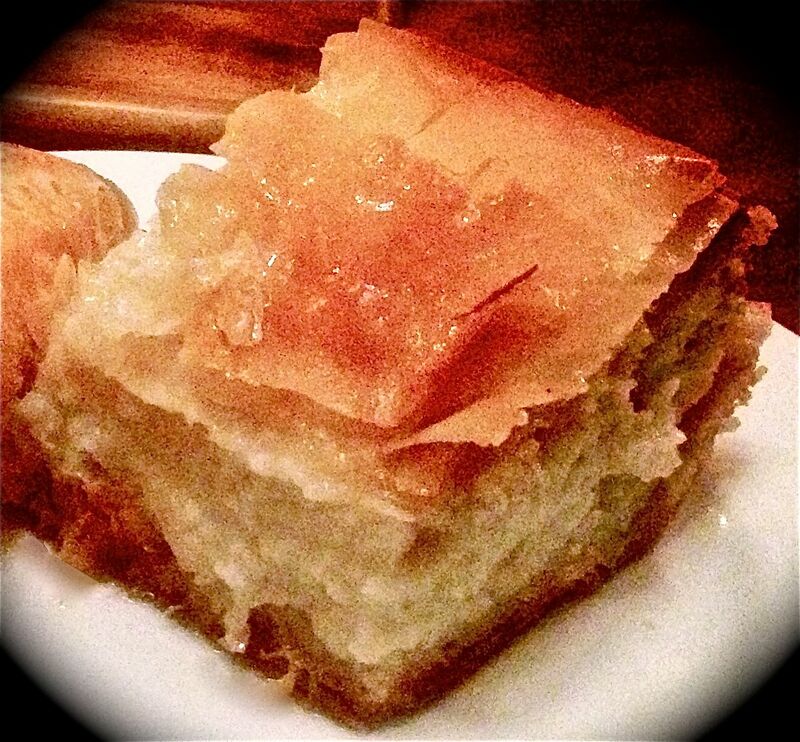 Repeat with half the butter and filo sheets. Now repeat with the remaining filo and butter. With a knife score the top of the filo to 4cm squares. Cook for 50 minutes until golden brown on the top. Combine all the syrup ingredients into a pan on the stove on high until boiling. Now reduce to a simmer for 10 minutes until syrup reduces. Cut the cooked pie from where you have scored in the dish and pour over the syrup omitting the rind. Allow the syrup to soak into the pie at least 30 minutes prior to serving. I mention in there about oil spray. This will dramatically reduce the butter amount in the pie, thus reducing the fat content. If you’re not fussed about the extra butter then ignore the spray option. If your not a fan of orange if is fine to omit the rind, many custard pie recipes don’t actually include this (I think it makes the pie better personality). I also recommend using rice milk as it’s much sweeter than cows milk, which is why I only have ½ cup of sugar in the custard. Tags: custard, greece, greek, Greek custard pie, pie	. I am curious to find out what blog platform you happen to be using? I’m having some small security problems with my latest blog and I would like to find something more safe. Do you have any recommendations? Have you ever considered writing an ebook or guest authoring on other websites? I have a blog based upon on the same subjects you discuss and would love to have you share some stories/information. I know my subscribers would enjoy your work. If you are even remotely interested, feel free to shoot me an e mail. Hi there! I understand this is kind of off-topic but I had to ask. Does running a well-established blog like yours take a lot of work? I am completely new to blogging but I do write in my diary on a daily basis. I’d like to start a blog so I can easily share my own experience and feelings online. Please let me know if you have any kind of suggestions or tips for brand new aspiring blog owners. Appreciate it! Pretty good post. I simply stumbled upon your weblog and wanted to say that I have truly enjoyed browsing your weblog posts. In any case I’ll be subscribing to your rss feed and I hope you write once much more quite soon! Greetings from California! I’m bored to tears at work so I decided to browse your site on my iphone during lunch break. I really like the info you present here and can’t wait to take a look when I get home. I’m shocked at how quick your blog loaded on my mobile .. I’m not even using WIFI, just 3G .. Anyhow, awesome blog! Heya! I understand this is sort of off-topic however I had to ask. Does building a well-established blog like yours take a massive amount work? I’m completely new to running a blog but I do write in my diary every day. I’d like to start a blog so I can easily share my own experience and views online. Please let me know if you have any suggestions or tips for brand new aspiring blog owners. Thankyou! Some actually interesting info , effectively written and broadly speaking user pleasant. Nicely done! – I looked at the Wiki on this and it did not have as detailed info – thanks! site. I’m hoping to check out the same high-grade content from you later on as well. Awesome, so happy to hear that Robyn! Now, I entirely believe what you’re saying. However your post is just too short to get all the facts over. Perhaps there is an approaching part Two or even part Three of the post developing? Sure what content in particular would you like to hear more on? Thanks Amos! You have placed a massive smile on my face! Thanks Edward. Please do, I really appreciate your comments! I simply want to mention I’m newbie to blogging and absolutely enjoyed your web-site. Very likely I’m planning to bookmark your blog . You surely have superb well written articles. Regards for revealing your website page. Thank you for the lovely words, so glade you are enjoying my blog and may bookmark it. Sorry Hester. Twitter is the one social networking platform I dont have. I absolutely love your blog and find most of your post’s to be exactly I’m looking for. Do you offer guest writers to write content for yourself? I wouldn’t mind producing a post or elaborating on a lot of the subjects you write concerning here. Again, awesome web log! Hi rtheptple, so glade to hear my blog is providing you with recipes you are looking for. I have never though about guest writers before as I generally bake a sweet treat and if it gets great feedback from my work team and I love it I will post my recipe with my notes and my thoughts. I’m definitely open to it. I would be very happy to include a link to your content in my blog if you have further relevant info to a recipe? This is one of my favourite desserts, the rice milk is an excellent idea- can’t wait to try it out! Please do Nicole and let me know your thoughts on it!